I have always been drawn to furniture that is simple in form and without too many decorative embellishments. Shaker and Arts & Crafts furniture were natural inspirations for me because of their simplicity, profound desire for quality in construction, and use of advanced joinery. Both periods of furniture design focused on the beauty of the species of wood used with little if no additional decorative embellishments. My work stresses key principles of fine craftsmanship that highlight the materials while allowing for natural wood movements. These include mortise and tenon, rabbet joints, and floating panels. I finish my furniture pieces with natural oil and varnish finishes, usually six coats, each coat hand rubbed and never anything that will hide the beauty of the wood surfaces. A final set of two coats of paste was on each piece of furniture invites you to touch it with a silky smooth feeling under your fingers. Some years ago, I visited the workshop and museum of George Nakashima and toured the grounds with his daughter Mira. His outstanding views of beautiful wood as a medium, the simplicity of design, and respect for the wooden form has deeply affected me. My favorite pice to date, a solid walnut credenza with hand cut narrow dovetails was built with great respect towards Nakashima's designs. As I fell in love with the simple styles I saw in many mid-century modern pieces the same simplicity, geometric forms, exposed joinery, and simple finishes that I wanted to expand on. I would say that my work now is a hybrid using elements of each period in original designs that show off the color and texture of wood all with real-life use of myself and clients. The same is true for much of the Shaker, Arts & Crafts, and Frank Lloyd Writght’s furniture styles. I work with clients very closely during the design phase of each commission. 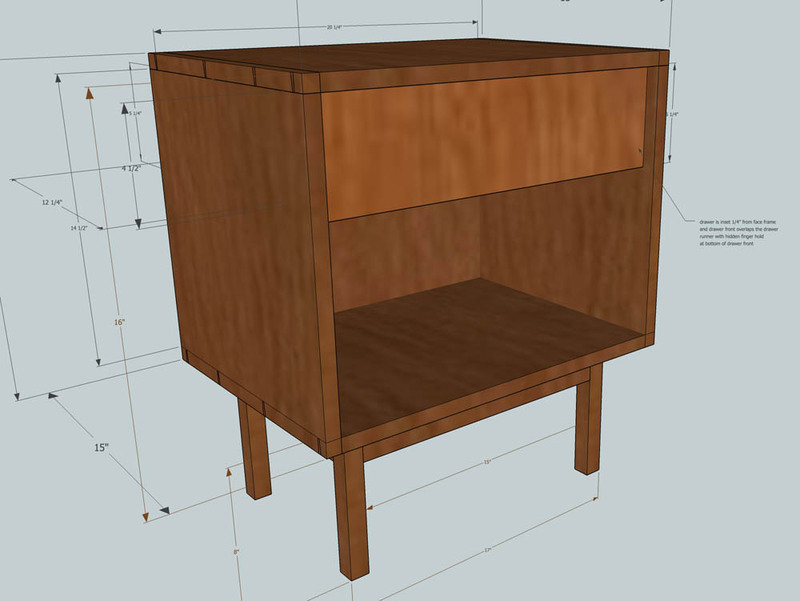 I use 3D CAD programs to refine the dimensions and send clients updates as we narrow down the design so that they see the piece from all angles. I also send clients photographs of their piece(s) as I cut, assemble, and apply finish so they see their furniture come to life. All of my designs are customizable in both size and finish, so as you look through the designs on the website, contact me with special requests. I want to ensure that furniture that I build for you works in harmony with your home and style of living.